mention of Little Willie John, but full attention when Mo got the Fever…the man who had great success with Fever and Need Your Love So Bad could call himself whatever he damn-well liked! More Tex-Mex Ry Cooder (Across the Borderline), then SRV. Dave Dryden’s take on Stevie Ray Vaughan (and later Hendrix) is quite an experience. Striking out on Cold Shot with SRV’s trademark Texas shuffle this alone was worth the price of admission. The Mo Scott Christmas party wouldn’t be complete without a Muddy Waters’ number, so, we got Blow Wind Blow. What followed was the blues highlight of the year. Red House, for ever associated with J. Hendrix, featured Dryden’s brilliant guitar playing and Mo’s frenzied Come on! exaltation. Hendrix at his best (the absence of psychedelia), Dryden a master musician. Long before the end of the one hour first set they were up partying dancing to Mo Scott’s fast-paced selection of tunes, Knock on Wood and many other dance floor fillers keeping them on their feet. An interval festive feast, a raffle (! 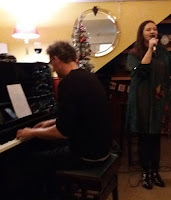 ), and an unexpected bonus downstairs as Julija Jacenaite sang a few tunes, simply for her own satisfaction, once more accompanied by pianist Alan Law (a short review of their earlier set is appended to this posting). Mo loves Ray Charles so Let the Good Times Roll kept the party going as the second set got under way. The Neville Brothers, Bonnie Raitt (River of Tears), then more SRV. Pride and Joy, oh yes! A truly magnificent version of Vaughan’s signature tune. Mo Scott – she’s our pride and joy. Vocalist, bandleader, raffle meister, Scott took a breather as the boys launched into an ostensibly unusual, if not incongruous, choice of material. 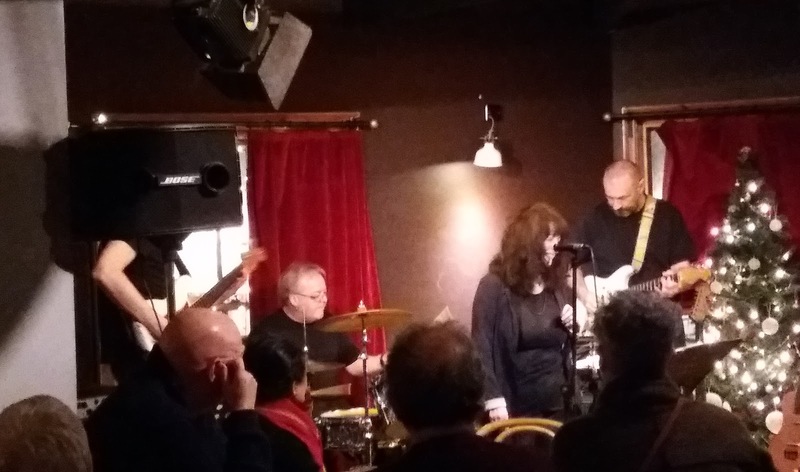 Billy Cobham’s high-energy jazz-fusion workout Red Baron hit new heights of virtuosity; Dryden shredding with taste (an oxymoron? ), Harland, a towering funking presence, Smith’s killing snap on the snare. Middle period Stones (Miss You), King Floyd (that’s King, not Pink), All Along the Watchtower (Jimi Hendrix’s version) produced more brilliant guitar playing from Dryden, Mo was clearly enjoying it all as she called out to Sonny Boy, Help Me. It was fast approaching midnight but the audience wasn’t going to let Mo go without an encore. The Empress of the Blues took it home on Route 66. Earlier in the evening in the Jazz Café’s downstairs bar Lithuanian-born, Tyneside-resident vocalist Julija Jacenaite selected a few standards to sing accompanied at the piano by Alan Law. Misty with Jacenaite wringing out every last drop of emotion, a rollercoaster Love Me or Leave Me, a lengthy, note-filled take on One Note Samba, then due to a slightly late start to their set, Jacenaite and Alan Law concluded matters with JJ’s ever-expressive rendition of Angel Eyes. During the interval of Mo Scott’s gig a trip to the downstairs bar found Jacenaite and Law playing to a couple of barflies. Two numbers were heard during the interval; first, All of Me then an interesting arrangement of Mood Indigo.